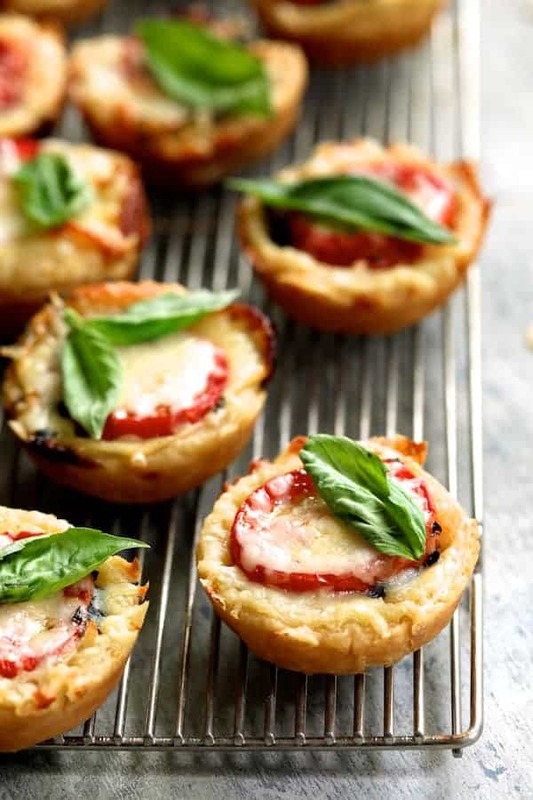 Mini Southern Tomato Pies are an elegant twist on the down-home and iconic Southern Tomato Pie. 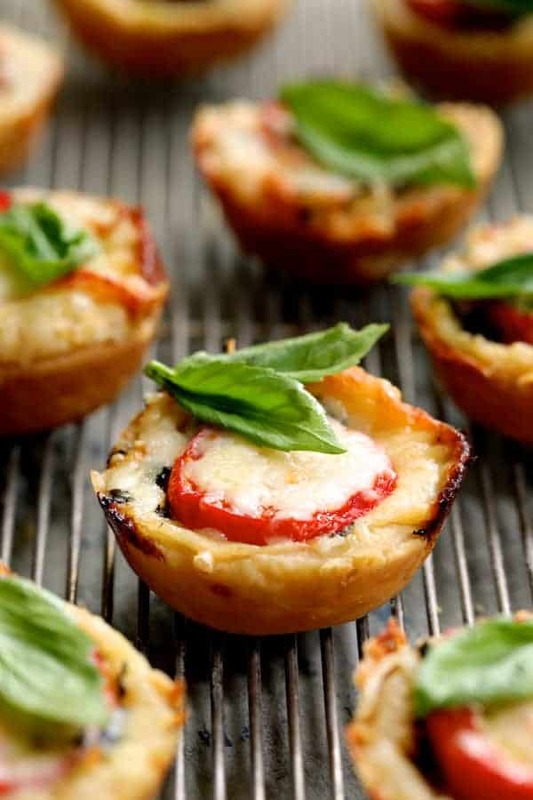 In mini form, they make a lovely summer appetizer! Hey, all! I know… been a while! We were up in Wisconsin for a little over a week for our annual trek to the Northwoods to see family and for some relief from the Southern heat. I about melted and didn’t see any relief until our last day or two there. My father doesn’t have central air conditioning and we have to sleep in a second-floor bedroom. We can get this out of the way right now–I’m spoiled beyond belief and LOVE my air conditioning. One of the things I love about going home is it takes me back to my roots and brings back so many memories of growing up like the amazing pies my mother used to make. My mom was one helluva pie maker but she never made a tomato pie. I’ve not made many pies but I have made tomato pies! It’s just what one does when they live in the South. Here’s an elegant riff on the classic Southern tomato pie you’re going to love! 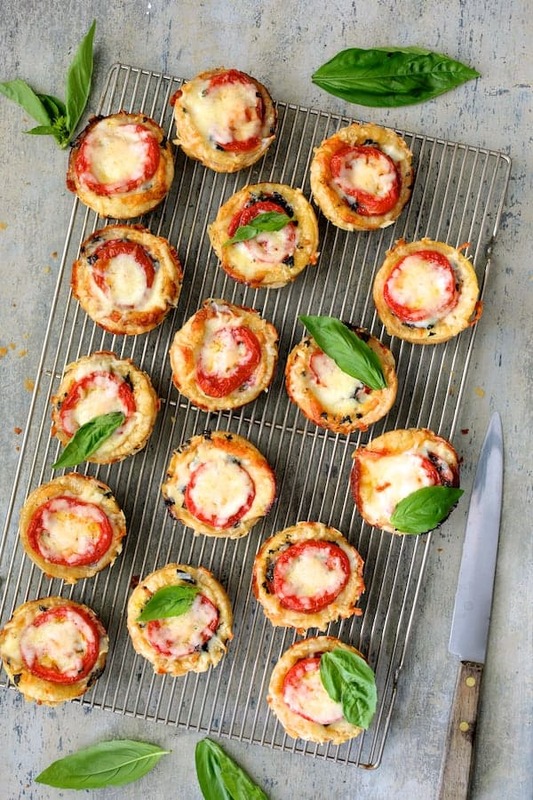 Mini Southern Tomato Pies! Slice approximately four ripe, juicy plum tomatoes to get 32 slices. Salt, then place on paper towels to drain. The salt helps extract much of the water from the tomatoes (which you don’t want in your pie). Flip, then salt again and drain. After 30 minutes or so, blot dry with more paper towels. 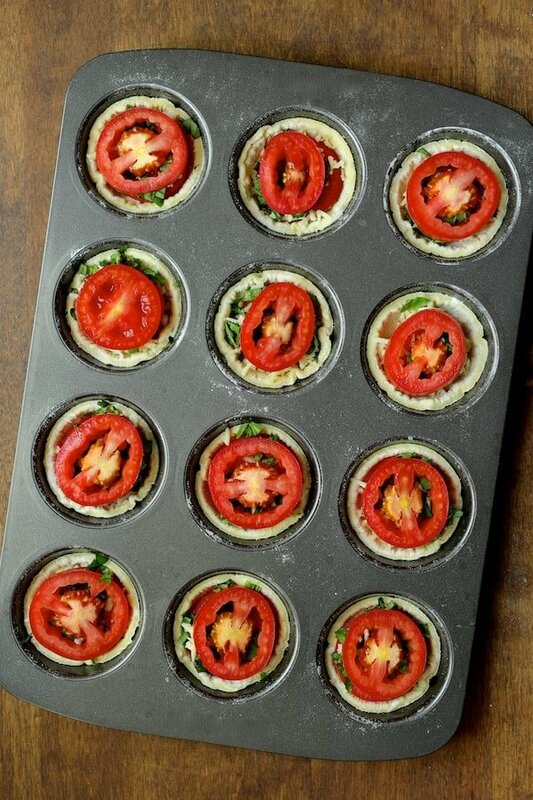 While the tomatoes are draining, get the pastry shells ready. Frozen puff pastry makes the perfect crust! Just roll it out on a lightly floured surface so you can get eight circles from each piece of puff pastry. 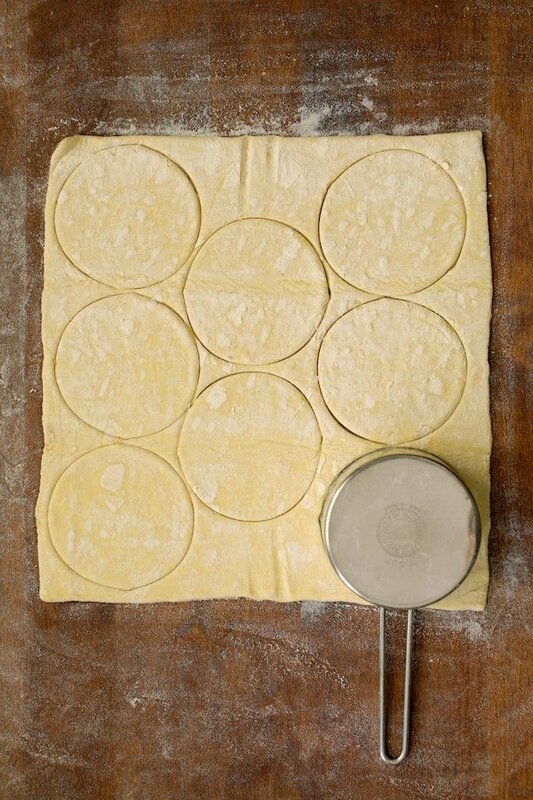 Cut the circles out with a 3 to 3 1/2-inch biscuit cutter. Or, do what I did–use a stainless steel measuring cup. 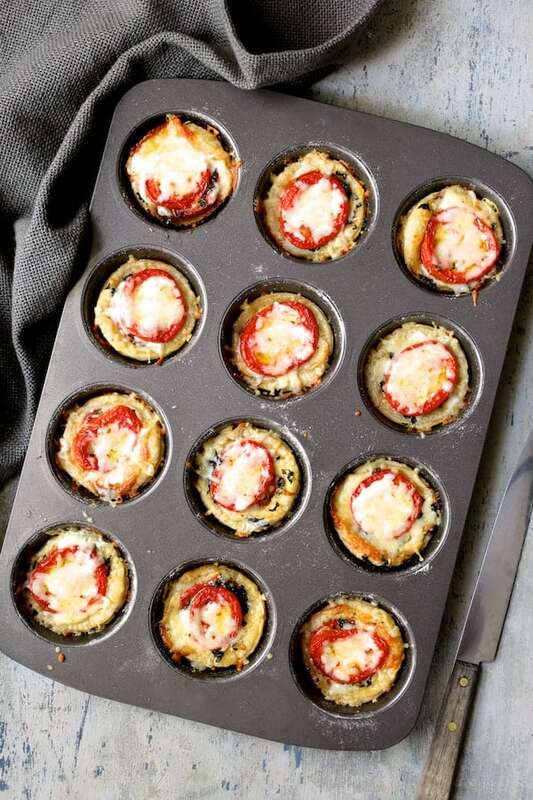 Pop them into a nonstick muffin pan and just push them in enough to get a flat bottom. Then, start the filling process! Start with the cheese and mayonnaise combination. Mayonnaise is an essential ingredient in Southern tomato pie! 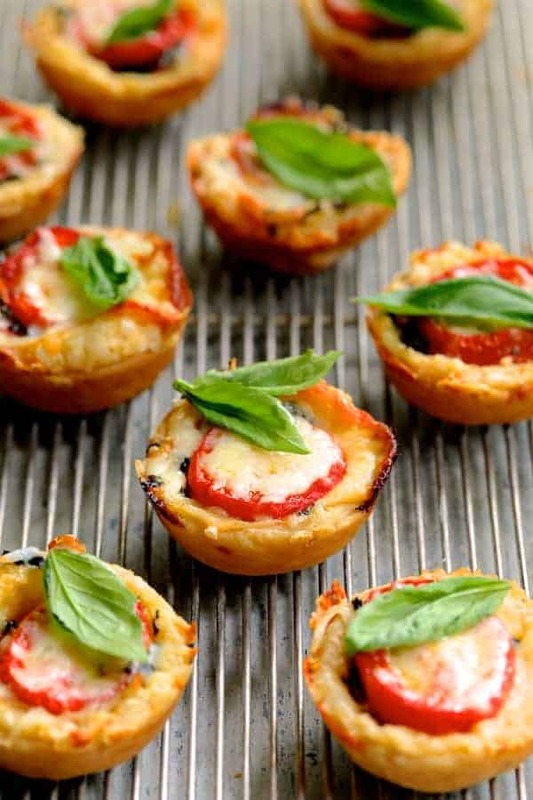 Top with a tomato, a little more cheese, some basil…. The tomatoes are going to sit pretty high but trust me on this. The puff pastry is going to do its thing and puff up; the tomatoes will sink in. After approximately 30 minutes, remove from the oven. The tomatoes may shift a little bit, but no worries! Just push them back into place with a knife then top with the remaining cheese. Bake 5 more minutes and…. …Voila! 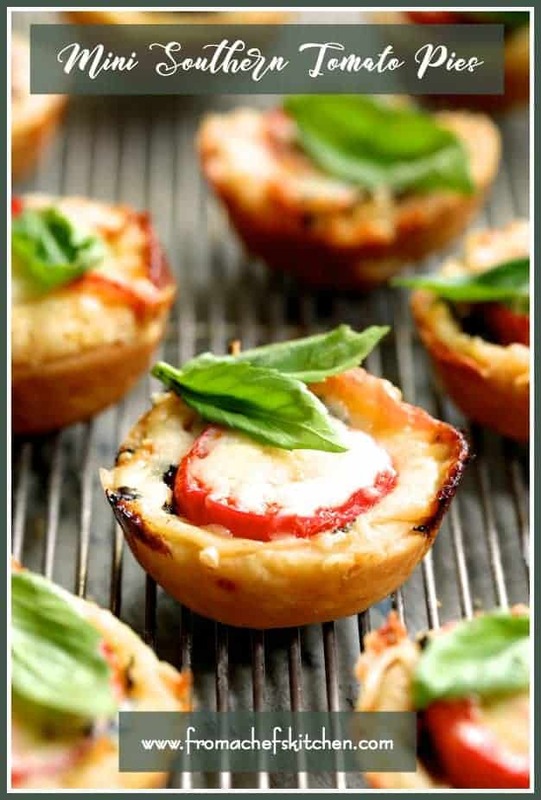 Beautiful, elegant Mini Southern Tomato Pies! Perfect for a backyard get-together or other summer special occasion! Serve immediately or at room temperature. Garnish with fresh basil! 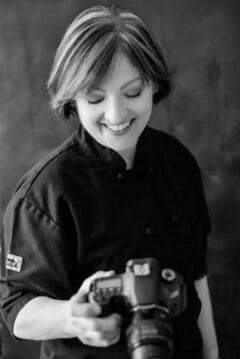 Be sure to try my other tomato pie/tart recipes! Slice the tomatoes into approximately 8 slices each so you end up with 32 slices. 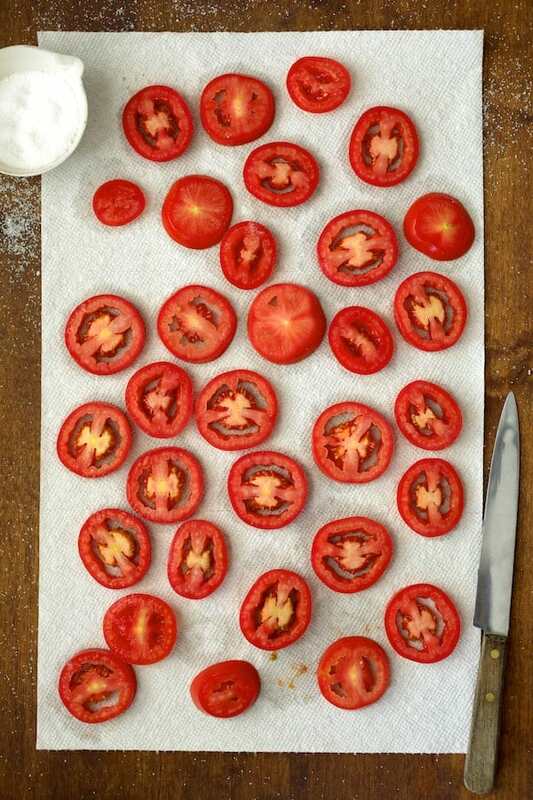 Place the tomatoes on paper towels and sprinkle with 1 teaspoon salt. Let stand 15 minutes. Flip onto dry paper towels and salt again. Let stand for another 15 minutes. Dry the top side of the tomatoes with paper towels for any remaining moisture. While tomatoes are draining, prepare the pastry. Roll out onto a lightly floured surface. 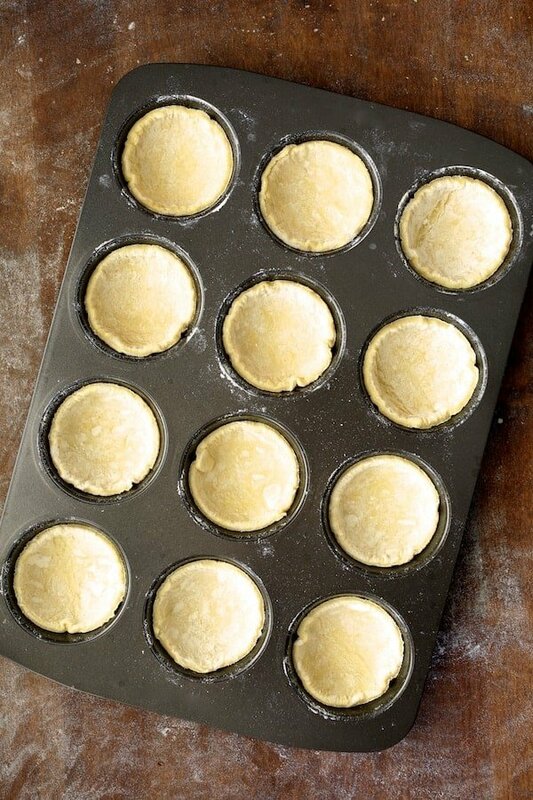 Using a 3 to 3 1/2-inch biscuit cutter or round stainless measuring cup, cut 8 circles from each sheet of pastry. Cover with clean kitchen towels and refrigerate until needed. Combine 3/4 cup Gruyere cheese and 1/4 cup Mozzarella cheese in a bowl. Add mayonnaise and black pepper and stir well. 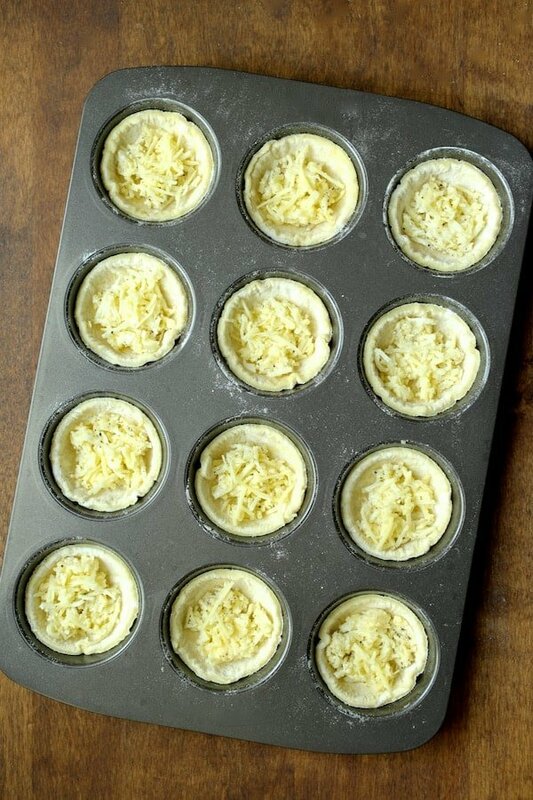 Divide cheese and mayonnaise mixture evenly among the 16 pastry shells. Top each with a tomato slice. Using only about 1/4 cup of the Gruyere, sprinkle each tomato slice with a small amount of cheese. Top with the chopped basil. Place the second tomato half over the cheese and basil. 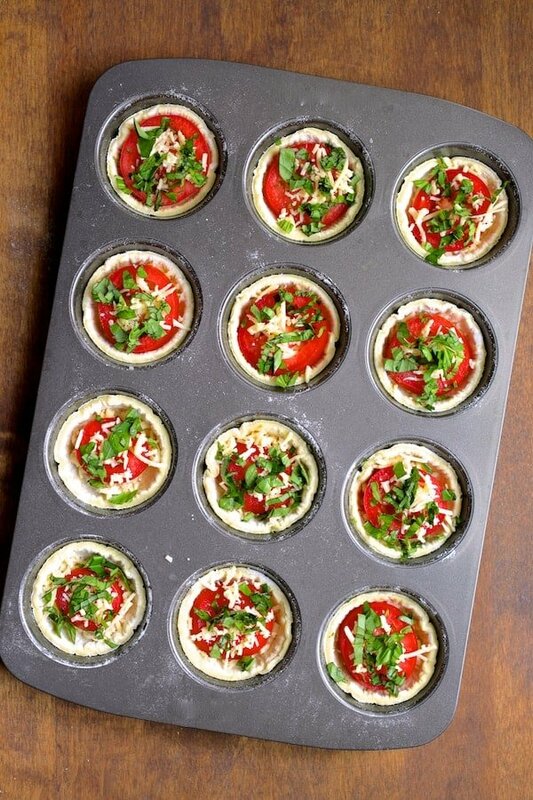 Place in the oven and bake for 30 minutes. Combine the remaining 1/4 cup Gruyere cheese and 1/4 cup Mozzarella cheese. Remove from the oven and adjust the tomato slices as necessary so they're back up on top of each other. Top with remaining cheese and place back in the oven for 5 minutes or until cheese is melted. These are brilliant! Cute and tasty. 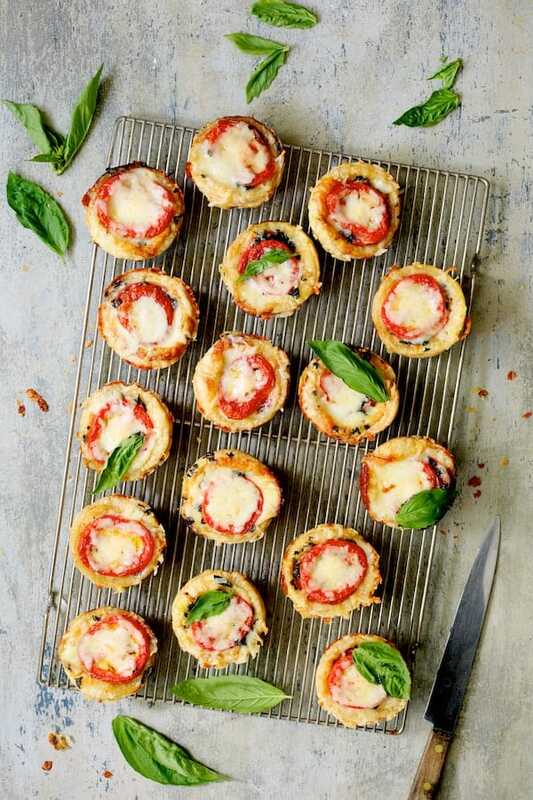 I’ve made many a variety of tomato tarts and these are just perfect. I tend to forget to have puff pastry in my freezer, but it makes every kind of tart just magical. Thank you for this idea. Thanks, Mimi! I always have puff pastry in the freezer. It’s good for so many things!